Despite the earlier posts about Connie, I hadn't got around to listening to her... until now. WOW! This young lady is something else. 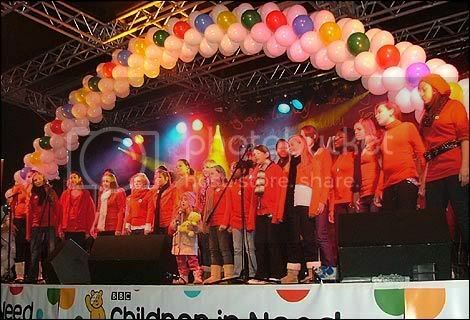 Knowing that Hayley was six when it was recognised that she has an exceptional voice, Connie's future looks extremely promising. I can but hope that she receives encouragement and support but is not pushed too hard. Provided she takes good care of her voice and allows it to develop - and she will need a lot of guidance for that - she could be a truly world-class performer. I would not have believed a little girl of 6 could manage that song, it is just so beautiful. She also comes across as loving what she's doing. I just hope that what Roger said in his post is allowed to happen and that she has the same sort of encouragement that Hayley has enjoyed. No thank you Peter, that's just awful! I can only echo Grant's words. I suppose they like that sort of thing in Bulgaria. For me, even the pseudo-Tijuana brass didn't help. As this is Connie's thread, I think we'll stick to her version! She's a Star already. A little darling. I think Hayley would be an awesome mentor for this little girl... perhaps help her go at the right pace as you mentioned previously, and keep her out of trouble A concert with both of them would be.... well fabulous! PS: can you believe how pitch perfect little Connie is?!!!! Her Compelling personality and angelic voice are unmistakable. The only change is her famous gap-toothed smile which has been replaced by two almost fully-grown teeth. That's how long it's been since six-year-old Connie Talbot won our hearts and reduced the nation to tears with her emotive performance of Over The Rainbow. Although she just missed out on winning ITV1's Britain's Got Talent show in June — the winning prize of £100,000 and the chance of performing in front of the Queen at next month's Royal Variety Performance went to classically trained opera singer Paul Potts — the schoolgirl was hailed as the next Charlotte Church. For Connie and her family, auditions for the show had started as simply a fun day out after she spotted the search-for-talent advertisement on television. But their hopes were raised when lead judge Simon Cowell, who Connie idolised after watching him on The X Factor, described her act as "pure magic" and vowed to make her a star, earning "£1 million-plus this year". The avalanche of attention during the show even made it necessary to hire a 6ft 10in bodyguard for Connie, who was all the more endearing for the fact that, because her parents were unable to afford singing lessons for her, she'd practised on a £39.99 karaoke machine. Two months later, however, Connie's dreams were crushed after Cowell's music label, Sony BMG, decided she was too young for a recording career. She seemed to be heading for oblivion like other talent show stars. But Connie has been given a second chance and has been secretly working on her debut album Over The Rainbow, which will be released at the end of this month, and a single which music experts are tipping for the Christmas number one slot. The team behind Connie's new album are John Arnison, who used to head the London office of the company who managed Status Quo, Genesis and Phil Collins, and who now personally manages Billy Ocean, Mica Paris and Gabrielle, along with partner Marc Marot, former managing director of Island Records. With Connie's parents, they carefully worked out a recording schedule and format which meant the child star was able to carry on with her normal school life. "If she'd gone with Simon's label she would have been working as a fully fledged professional in the industry, doing promotional work and touring,' says her mum Sharon. "We were naive in not realising how much that would have affected her life. Instead, we found a better solution which has not robbed her of her childhood." Connie is grinning as she puts on her baker boy hat and twists it around to the perfect angle to enhance her openly friendly face. 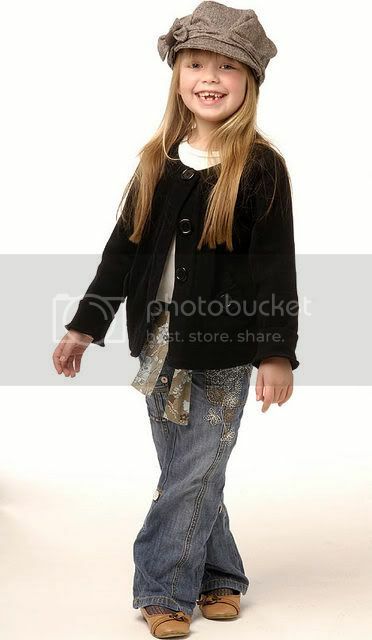 She has the poise and projection of a child who has been put through the rigours of stage school. It's hard to believe this is not the case. Even during her live television renditions of Over The Rainbow, Connie stood unflinching with the demeanour of an old pro. Had she performed in public before? "Only to open the Christmas carol concert at our local church with Once In Royal David's City." It reduced the congregation to tears. Were you terrified of performing in front of the Britain's Got Talent judges, Connie? "Never." Are you scared of the television appearances on This Morning with Fern and Phil, and possibly even X Factor which are coming up to promote your album? "No." Do you ever get nervous? "Never." All this said through a smile and unblinking eyes, interspersed with a few giggles and rolls of her head. Her astonishing control must be the result of the confidence and devotion of her parents, thanks to a six-year age gap between her and her older sister Molly, 12. She must also know how pure her voice is not to feel even a jangle of nerves. She's right to because, like Cowell, and fellow judges Piers Morgan and Amanda Holden, her new team are astounded at her talent. "Simon Cowell is the hardest man in the business so I knew she couldn't have got far unless she was genuinely talented," explains Connie's manager, John Arnison. "Even so, I asked myself: 'Can she sing?' When I met her, I was blown away. "What will amaze people is not that she's talented, but just how talented she is. She sings naturally and effortlessly." Arnison has set up an off-shoot of his usual record label, Rhythm Riders, called the Rainbow Recording Company, specifically named to fit Connie's profile as a child artist. "The other name was inappropriate for a child. I can see why Simon's company were wary of signing Connie because I was too. "I'd never worked with a six-year-old — it's daunting. Colleagues said people might think we're exploiting her. "Connie hasn't had singing lessons and we won't give her any. Unlike some companies who might insist on a voice coach, we don't want to mould her voice and style. "She is far too young to be put in a box and to decide which path she should take. "Nor do we want to put her through the promotional grind which most artists go through because she is too young. "This is one of the reasons why we kept the project under wraps. Connie is talented and deserves to be able to make an album. As long as it's done in the right way, I can justify getting involved." It was with this approach in mind that Connie recorded her album in her Aunty Vicky's spare bedroom near her home in Sutton Coldfield in the West Midlands. A soundproofed recording booth was set up, but Connie still had to stand on an old suitcase because she couldn't reach the microphone. After each session the family and production crew would have dinner together — sometimes takeaway, other times with Aunty Vicky cooking Connie's favourite chicken curry. Cynics may argue this sounds a far cry from the slick approach of more corporate record labels, but John says: "Connie's parents were very keen for Connie to come back after school to something that was fun, not like work. "Nor did they want to disrupt her usual routine by taking her to a huge recording studio away from her home town." Sharon, 38, a part-time worker for an electric company, who lives with her husband Gavin, a 40-year-old self-employed property maintenance engineer, their 14-year-old son Josh, and Molly and Connie, says: "It's worked out for the best, even after the initial let-down from Sony BMG. "Connie had gone to their studios to record Over The Rainbow and Smile. The initial feedback was amazing, but we went on holiday and came back to find they'd changed their minds. "The look on Connie's face was of sheer disappointment. "If I think her personality's changing in any way, I'll put a stop to it. "But while she loves what she's doing it would be cruel to stop her. Fame and money will never matter. "She'd begged us to let her audition when she saw an advert for the talent show after The X Factor one night. "We saw it as a day out." But despite a lowkey approach to launching Connie, with a day of radio shows, and three national television programmes, including a performance tonight on Children In Need, it may be impossible to hold back the floodgates. "It was scary at times during Britain's Got Talent because of the sudden fame," says Sharon. "We even had a madman at the bottom of the garden singing Over The Rainbow. That's why Connie had the bodyguard." The family has had to change their phone number because they were inundated with people calling them from all over the world, some of them crying hysterically because she didn't win. Connie is also already receiving worldwide offers about acting roles for films, musicals and other record deals. She is also getting 50,000 hits a day on YouTube — of which 30,000 are from America. "Things are really hotting up," admits Arnison. "But we don't want to spoil Connie and we don't want a quick profit. At the moment, the invitation to turn on the Christmas lights in her local town, Walsall, is what she's thrilled about." Arnison agrees with Cowell's assessment that Connie has the potential to make £1 million this year alone. "Gavin and Sharon have never asked about the money side because it's never been about that for them," he says. "Naturally we are hoping for a Christmas number one, but there will be competition from The X Factor winner." Former judge Amanda Holden yesterday said: "I am sure the album will go through the roof. She's got the 'cute factor' but with the talent to back it up." And luckily, there are no sour grapes from Cowell, who still sees Connie's potential. 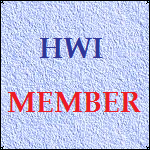 He says: "When the time is right I will be delighted to see if we can make it work. Connie's an amazing girl with a beautiful voice." At home, Connie likes to sing all over the house, but never at school. "I never like to sing in front of my friends," she says. "I didn't tell anyone I was doing the show and after they saw me on telly, they all wanted to touch me. It was funny." Connie's talent came to light when her grandmother was diagnosed with breast cancer. "When her nan was really ill in bed, Connie used to sing songs from The Wizard Of Oz to cheer her up," says Sharon. "It was her grandmother who first told me: 'She'll be a good singer in a few years, you know.'" When her grandmother died three years ago, aged 72, Connie sang Over The Rainbow at the funeral. It became her signature song on the show, wowing over seven million viewers and leaving the three judges speechless. As her mum says, if you didn't already know about Connie's talent, then you wouldn't know, because, really, she's the same as every other little girl in her class. For now. ■ Connie Talbot's album, Over The Rainbow, is released on November 26 on Rainbow Recording Company label, and her single, Over The Rainbow/White Christmas, on December 3. 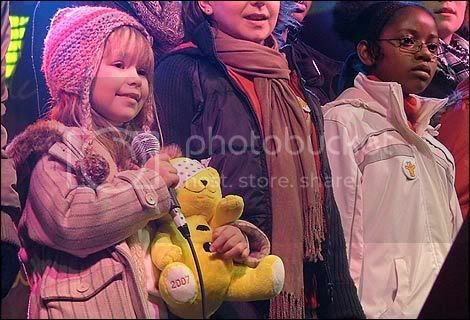 Connie performs at The Children in Need Party in Centenary Square on Friday 16th in Birmingham. I was rooting for Connie over Paul Potts on the Britain's Got Talent. Not because I didn't think Paul wasn't any good, he was, but there was nothing to distinguish him from other opera singers, so I was behind Connie (and another little girl who's name I think was Betsie, who was exceptional at musicals). I don't fall for the whole 'oh she's so cute' routine, but I do recognise talent when I hear it. When I first heard Connie I immediately thought 'Hayley'. She has perfect pitch and at such a young age, just as Hayley did. And that is rare. Paul Potts is not rare. I'm sad to hear that Simon is going to make money out of Connie - and at such a young tender age. I'm not sure if its right. I recall the mother saying at the time of hte competition she had no interest in Connie recording anything and releasing CDs until she was much older. I guess she changed her mind. It's morally grey for me, I'm afraid.